Well, I AM going to print it out and put it on the fridge, or back door before I leave to go train LOL. Very good! I have huge troubles with sniffing, and I’ve been very guilty of doing some of these wrong things, and likely making it worse! Great points to burn into my brain! Tack, ord för det jag försöker förmedla mina kursare just nu! Förresten, när det gäller de där självbelönande beteendena, hundar som vill leka med andra hundar, hur skulle du hantera det? Lite svårare att bara vänta ut eftersom man stör någon annans träning då…. Of course, when training with others I would keep a leash on my dog if I thought he would run away and try to play with other dogs. Another solution, that we use in classes, is to make sure all dogs have crates that they work close by. If a dog decides to take off to play, we call “loose dog!” and all other dogs are sent to their crates and the doors are closed. The dogs in the crates are rewarded for staying calm when a dog is running off leash around them (something that at least border collies find very hard sometimes) and the dog that ran off is not finding any reinforcement. I love this game in puppy/foundation class. While this may work during training sessions and on leash, it won’t work with “high value distractions” with my dog. We have an underground fence, so she is off-leash in the yard. Just last night, she had her nose to the ground all over the backyard, until she found a woodchuck which promptly bit her. Following the critter to the edge of the property boundary, it was only then that she returned to me when I called her. I knew any verbal commands to “look” at me, “leave it,” or “come” would be futile, as well as any type of high value rewards to disrupt the chase, so I left her go at it so as to not set her up to fail. 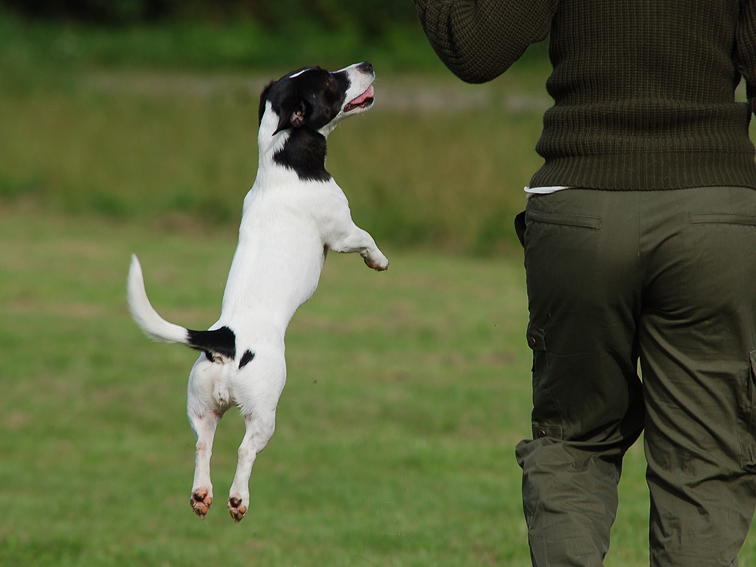 I was also recently told that I need to be “more exciting” when training the correct heel position so that my dog finds it more rewarding to be at my side, rather than being intensely focused on a distraction. Good thing she was on-leash for our walk yesterday when she found a dead bird. Very difficult to get her away from something like that, no matter how good she is following commands in controlled situations. That’s what I’d like to know how to handle–getting her to respond to me, no matter what. Any advice would be greatly appreciated. Fanny, I just came across this posting on your blog recently and found it very interesting and helpful. I am particularly interesting in following up on your above comment. I struggle with the sniffing issue, so I was wondering what are some examples of how you ‘work specifically on that.’ There is no higher value reward for my dog than sniffing so I use that as a reward when we are working outside. However, it is such a self reinforcing behavior for him that I am unable to call him away from it. Any ideas, other than taking Thomas’ Relationship Building class : ) (I am considering that.) Thanks for any comments on this! I would use sniffing as a reward outdoors and transfer the value from sniffing to other (more practical) rewards. Do not call him or ask for his attention when he’s sniffing, rather reward him when he checks back in with you. But I would also build up the value for toy and food rewards in an environment where you have success (start indoors).